Adebayo Akinfenwa could remain a Torquay player after Bristol City failed to agree a deal with Gulls' chairman Mike Bateson. 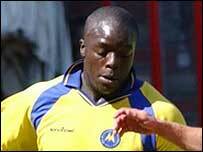 Swansea pulled out on learning Torquay will command a fee for out-of-contract Akinfenwa, who is under 24. Bateson told Torquay's website: "I had a chat with the Bristol City chairman and there's no deal on the table. "They're neither prepared to pay cash or risk a tribunal decision, and I'm not aware of any other interest." The development is the latest twist in a long-running saga over the unsettled striker who had been told by Bateson he has no future at Plainmoor. Both Akinfenwa and his agent were criticised by Bateson and Gulls boss Leroy Rosenior. Torquay have offered Akinfenwa - who scored 16 goals last season as the Gulls were relegated - a new deal which he has refused to sign.